Classic Bollywood movie poster of the blockbuster film, Taal (1999) for sale. This is an actual surviving classic Bollywood movie poster of the 1999 musical romance that starred Anil Kapoor (of Slumdog Millionaire fame), Akshaye Khanna and Aishwarya Rai in lead roles. Printed and circulated during the original first release of the film somewhere in the late 1990s, this Taal movie poster was printed for publicity of the film but never ended up being used. The lead couple Akshaye Khanna and Aishwarya Rai are seen in a passionate pose on the top. 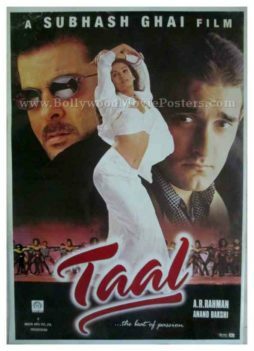 Anil Kapoor is seen in a flamboyant pose at the bottom of this glossy Taal movie poster. 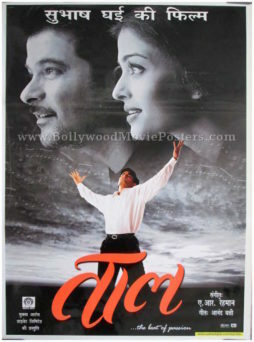 Classic Hindi movie poster of the blockbuster Bollywood film, Taal (1999) for sale. 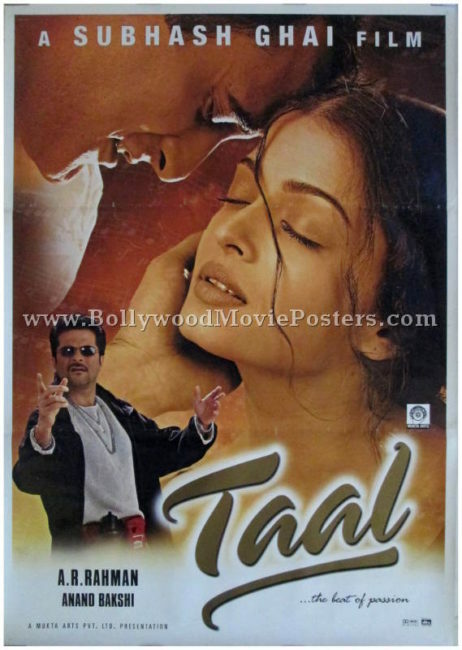 This is an actual surviving classic Hindi movie poster of the 1999 musical romance that starred Anil Kapoor (of Slumdog Millionaire fame) and Aishwarya Rai in lead roles. Taal was the highest grossing film of the year in overseas markets – becoming a massive success in both the US and UK. It became the first Indian film to reach the top 20 on Variety’s box office list, making this poster highly collectible! Printed and circulated somewhere in the late 1990s, this classic Hindi movie poster was printed for publicity of the film but never ended up being used. The three lead actors are seen prominently in photographic stills in this glossy Taal movie poster.